William Murphy will hang up the boots after playing his final game for Glenavon on Saturday. The 41-year-old central defender is set to lead the team out at Crusaders to end what has been a glittering Irish League career. When I left Linfield I thought my days of winning trophies was over, but Glenavon gave me the opportunity to go out on a real high. “Saturday will be my last game,” William revealed to the Mail. “The time is right. At 41 it does not get any easier. I have had a great career and I have especially enjoyed my two years at Glenavon. “I used to get stick from the fans when I was with Linfield - and rightly so - but they have been brilliant with me since I came here. 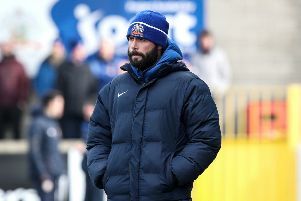 “I always felt Glenavon were a sleeping giant and Gary Hamilton and his back-room team deserve a huge amount of credit for what they have achieved. “To win the Irish Cup after so long and to qualify for Europe two years in a row is fantastic and I am pleased to have been part of it. “I am extremely proud of everything I achieved at Linfield but to win the Irish Cup and then finish third in the league a year later with Glenavon is right up there. Manager Gary Hamilton was full of lavish praise for Murphy. “William will lead the team out on Saturday. He has been an inspiration to everyone at the club since he joined us,” said Hamilton. William played 639 games for Linfield in a 16 year spell at Windsor Park and is regarded as a ‘legend’ by the fans. Saturday will mark his 48th and final game for the Lurgan Blues making it a grand total of 687. William signed from Ards and made his Linfield debut as a substitute in a 1-0 home defeat by Cliftonville on 20th September 1997. He won nine league titles and eight Irish Cups in a fantastic Irish League career.